This tribute is to an affectionately remembered former Physics teacher of Farnham Grammar School and Farnham College who died on 29 May 2017. John Commerford, a former Physics teacher at Farnham Grammar School and Farnham College, passed away on the 29th May 2017, following a period of illness. 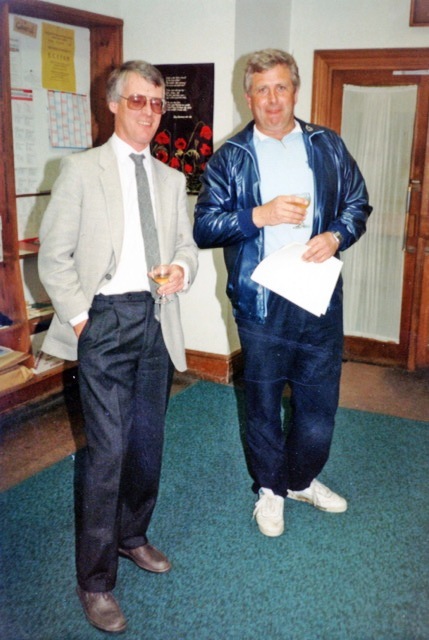 John Commerford and Roger Grogut in May 1988. The occasion was John’s leaving Farnham College to join the Associated Examination Board in Guildford. John was a well-respected teacher who was held in a great deal of affection by his students. He was personable and likeable and under his guidance, boys and later, on the merging of the grammar schools in 1973, girls were taught an appreciation of the fundamentals of Physics ‘O’ Level. In the 6th Form College, John taught ‘A’ Level Physics, Physical Science, and Maths. Following a sabbatical year to study for his M.Sc., John was appointed Senior Tutor. On the 23rd June 2017, a service for John was held in a packed All Saints Church, Tilford, followed by a celebration of John’s life in the Tilford Institute. Tributes were paid by people from different periods of John’s life, including Adrian Walker who was one of John’s students at Farnham College and Philippa Ridout from his time at the AEB (Associated Examinations Board, later the AQA) , while John’s fellow Tilford CC cricketers, and ex FGS/FC students, Nigel Martyn and Hamish and Alistair Macdonald shared by turn, moving and humorous recollections. Martin Philips, who first met John on their first day at primary school, opened the tributes confirming perhaps what many of us suspected, that John was an academically gifted individual. John was born in January 1951. As a school boy his only weaknesses appeared to be country dancing, in which he had a unique ‘washing machine’ style involving flailing legs and arms, and singing. He was in fact only allowed to join the choir on the understanding that he mimed! John was fast-tracked to Penge and Beckenham Boys’ Grammar School. He enjoyed football and tennis. However, his real passion which lasted throughout his life, was cricket. We heard that John was proud of the fact that his school was the alma mater for England spin bowler Derek Underwood. at the age of 21 was at FGS where he succeeded Physics master ‘Dickie’ Ward. John was a stalwart of Tilford CC for over 40 years, turning out for their 1st XI and 2nd XI as well as their Sunday team matches. On one occasion, while playing for TCC, John partnered the world-class West Indian cricketer Malcolm Marshall, in which in a batting partnership of over a hundred runs, John contributed just seven! There was a notable one-handed six from Malcolm and Malcolm graciously got out leaving John to score the winning runs. John also played for the Morley Road Academicals football team, Farnham Teachers’ Cricket team and Wrecclesham Tennis club teams. 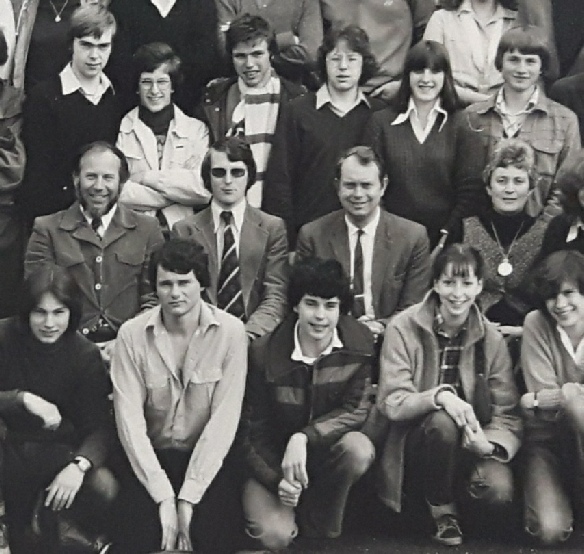 John looking cool in this College group photograph of 1979. Other staff shown include ‘Jessie’ James, Mr Ellenden and Anne Weeks. As a school boy, Adrian Walker remembered chatting to a youthful fellow at the college under the impression he was talking to a confident sixth former, only to discover a little later that he had in fact just been interviewed by John for admission to the college and moreover, he was placed in John’s tutor group. He also recalled that his then girlfriend and future wife, Debbie Young, was so inspired by John’s tutor group, that she left her own to join John’s. Old boy Jon Knight recalls an occasion in a Phyics lesson when John was drawing a graph on the black board showing velocity against time, or something similar, and he fell off the step at the end whilst keeping the chalk on the board, resulting in a graph of his own trajectory! While at FGS which later became the Sixth Form College, John developed a friendship with PE master, Roger Grogut, which extended to drinking beers at Farnham’s local pubs. John only drank in half-pints and when asked why, would say that it was because he was unable to keep up with Roger’s capacity. After leaving Farnham College in 1988, John joined the Associated Examinations Board, which later became the AQA. Philippa Ridout, a colleague of John’s at the AQA, recalled how John had the amazing ability to get the balance between professionalism and fun just right and always saw the good in people. A friend to all, and sociable as ever, he was made an ‘honorary girlie’ and on one occasion even went along on a hen night! The church service included ‘All Things Bright and Beautiful’ and ‘Jerusalem’, two hymn favourites from FGS assemblies. John celebrating with members of Tilford Cricket Club including Nigel Martyn and Mick Gorman. Following the church service and interment, there followed a celebration of John’s life, organised by Laurence Villaume and Jenny Commerford. 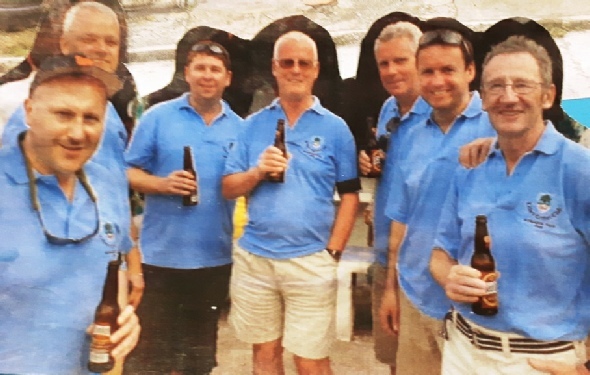 This was attended by several FGS Old Boys/FC students, including John Clarke, Paul Slinger, Chris Fitch, Chris Wilson, Chris O’Dell, Mark Bozier, Peter Slinger, Pete Withers and Andy Sayer. FGGS Old Girls who were present included Karen Noble and Rosemary Gorman (nee McDonald). There was a good turnout from former staff including, John McLaughlin, Betty Morris, Peter Wicks, Chris Chapple, Linda Fox, Christine Cox, Roger Grogut, Janet Jude, Rosa Knowles, Georgina Crawley and Carol McMahon.